In defense of luxurious facial cotton pads. While we entirely agree that the best things in life are free, we’d also argue that maybe the second best things are those little luxuries that make you appreciate how extraordinarily special they are—and that is exactly how I feel about my everyday cotton facial pads. Every night, I tone my face. I double cleanse in the shower, then when I hop out, I put a toner (either this one or this one or this one—I try to rotate between them) on a cotton pad to remove any excess makeup and grit from the day. Sure, I certainly could be using a ribbed cotton pad from CVS, and I have previously. But one swipe of its fancier, thicker, smoother cousin, and I have never looked back. The elevated version I’ve become addicted to are Shiseido Cotton Pads ($10 for 165). They are as soft as a cloud, yet super sturdy—no fuzz left behind here—and I love them. Those cheaper cotton pads always left little pieces of the pad on my face, and often felt like there were hard pieces of cotton mixed in, which resulted in a rough scraping of my skin. Do you know that feeling? The softer version feels like it’s gliding over your skin and picking up excess surface debris, but not disturbing your skin, while the previous cheaper versions always felt like they were leaving something behind, and harshly rubbing on my skin. If you are spending money on any type of skincare, these cotton pads are definitely worth the small investment. They can help improve the application and the effectiveness of your beloved skincare products. So, in defense of a higher end version, here are a few of my very favorites. My one true love, these are not too thick, and perfect for everyday makeup removal, toner, or essence. Shiseido says they’re made out of “100 percent natural” cotton, and are “uniquely manufactured for a consistent soft, smooth texture.” And while a pack is certainly more expensive than a standard $2.50 pack of cotton squares at the drugstore, you do get quite a lot for the price; it works out to only 6 cents a pad. The squares also have a pretty strong following in the comment section of Sephora, with nearly 1,730 5 star reviews, which is pretty impressive for an everyday basic. A Chanel bag or shoes is probably out of the budget for me, but a Chanel cotton pad is an everyday luxury worth considering. Every pad is delicately embossed with the Chanel logo, and that’s the type of luxe I’m looking for in this world. These are described by Chanel as “tri-layer pads” with the outer layers made of hand-picked cotton, and the inner filling composed of entwined elastic fibers for an ultra-plush experience. And they are thicker than thick, very absorbent, and very large. They nearly are the size of my palm, so while this is still an option for daily toner situations, one pad might be more ideal for makeup removal when you have a bold eye, since you can effectively remove makeup on one end and tone on the other end. As with most things at Muji, these are simple but great. They don’t have the level of softness associated with most of these others, but they are certainly more soft than a standard drugstore option. However, they do fall apart a bit easier when used to remove makeup, but they’re great for a quick tone at night, and work out to be just 2 cents a pad, which is pretty incredible. 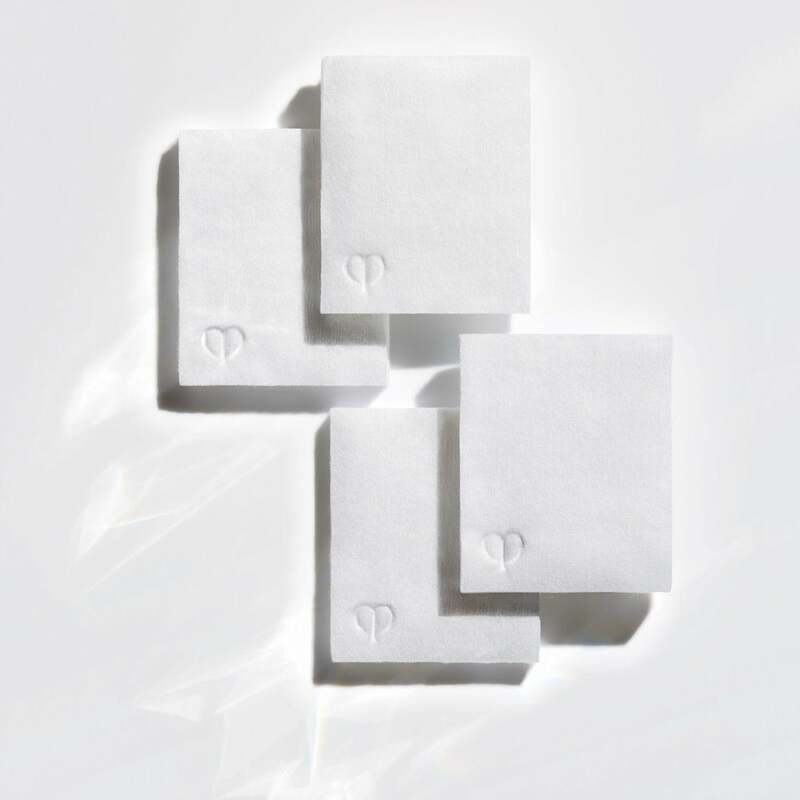 Another beloved version in the beauty world is Cle de Peau’s luxe cotton pads, which come in a little luxurious box. They are made from “natural silk” says the brand, which is pretty damn impressive. It’s slightly smaller in size than the Chanel version, but not in thickness—they’re incredibly cushy, smooth, and, of course, never pill. It’s at the same price per pad as Chanel, and they both feel about the same amount of luxuriousness. A total must if you want a nightly treat for the skin. These cotton pads are softer than your average cotton square, and bit more so than the Muji option. They’re a great cost-effective option (made of 100 percent cotton), but they are a bit thinner than the Shiseido pads. These are ideal for quick toning at night, but probably not so for pesky eye makeup.